Notes: Deluxe boxed set.. Features WILLIAM S. BURROUGHS, The Hacienda, October 4 1982. An IKON F.C.L. leaflet states: "IKON F.C.L. 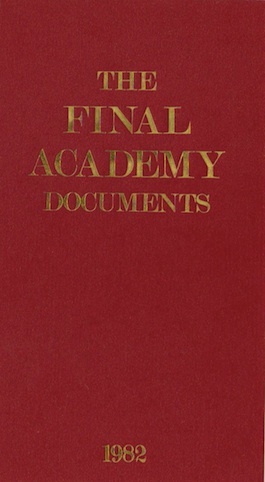 in collaboration with PSYCHIC TELEVISION presents: "THE FINAL ACADEMY DOCUMENTS"
- a double video package. 1. "Ghosts At No. 9" - archive film footage by Antony Balch featuring William S. Burroughs and Brion Gysin, plus the classic film "Towers Open Fire." 2. Documentary recordings of William S. Burroughs and John Giorno from the "Final Academy" evening, the Hacienda Club, Manchester, October 4th, 1982.
packing (European Orders £4.00p, Overseas £8.00p). Please specify which format is required: VHS or BETA (PAL standard only). * First two hundred Mail Order applicants receive free copy "Statements Of A Kind" booklet - normal retails price £5.00p!" In an interview with The Quietus in 2013, Richard H. Kirk said: "Yeah. Well, as you know we were all mates with Throbbing Gristle who had sadly split up and then Sleazy and Gen went on to form Psychic TV and we were kind of involved in that a little bit. We made a video piece for a Psychic TV release, that I don’t think ever saw the light of day and obviously being totally into [William] Burroughs it just seemed like it would be fantastic. Brion Gysin was there. John Giorno was there. Psychic TV, Last Few Days and maybe 23 Skidoo as well. We were performing more of a low key ambient piece where the films were important and the soundtrack less so."